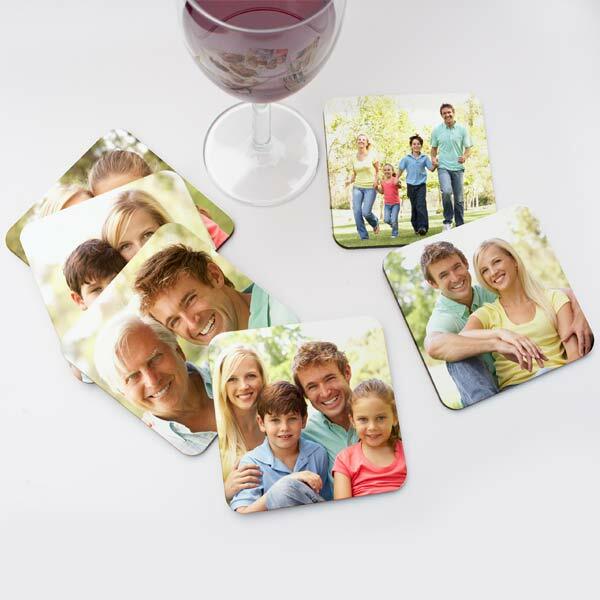 Custom photo coasters are great for your home or as personalized gifts. 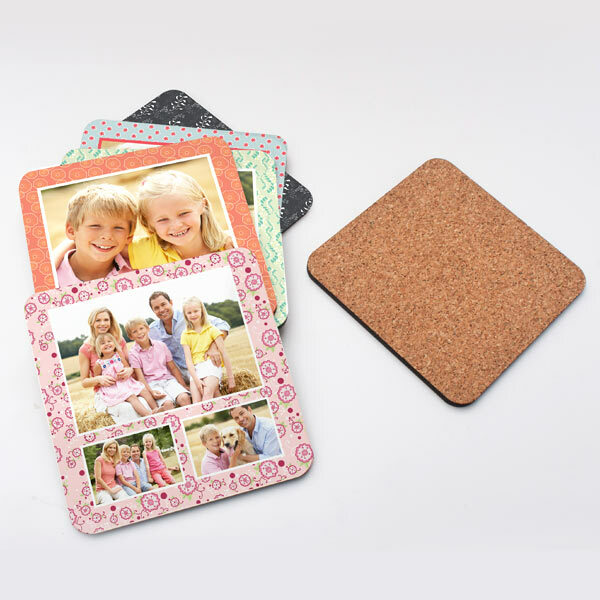 It’s easy to make a personalized photo coaster set using your photos. Simply drag and drop different pictures to the front of each coaster or use the same photo for every coaster. Maybe you have a series of favorite wedding photos. Or, you’ve been thinking of printing a few photographic favorites saved on your phone! Celebrate them in style with a decor accessory that’s practical for everyday use! Furthermore, we have dozens of template options so you’re sure to find a design that compliments your personality. We offer several kitchen and dining accessories options! In addition, we have laminated placemats you can personalize with pictures and text! As a result, you can thoroughly upgrade your dining decor with a personal touch! I just received my order of coasters and they are amazing. The colors are brilliant and the quality is excellent – very sharp and as good or better than my original photographs. I love it that you can order a different photo on each coaster! 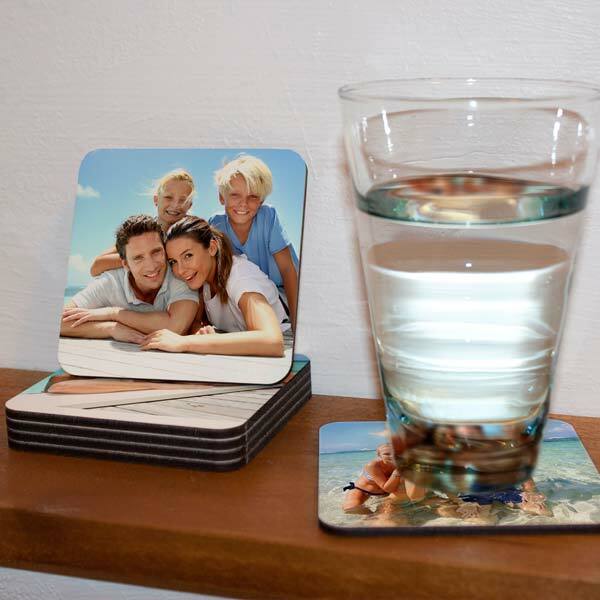 There is a glossy coating on each coaster that looks durable. I am so happy about these. I am giving these for gifts with sentimental memories on these photos and I think that the recipients will cry when they see these. If you are considering ordering coasters, you will not be disappointed. Also – they arrive in a very secure packaging to not get damaged. Love my coasters! And they make terrific gifts. What a professional company. When I had trouble completing one of my orders, Mailpix came to the rescue. I am very pleased with the product, the service, and the support. I would like to thanks the staff for all of their help. I had a bit of trouble they were very patient, kind and understanding. All the time never making me feel like a failure. Thank you so much, I received my order in plenty of time for Christmas. Very cute and easy gift idea! Came out nice! The coasters I ordered were beautiful! My husband loved them too and the shiney coating looks great over the pictures. I will definitely order more and give away as gifts. I was sent the someone else’s creation on accident. All I had to do was send a quick email And they took care of everything for me! Made it very easy to get the right product sent to me!